When a play leaves you speechless and thirsty for more, the playwright, cast, director, and other creative team members have done their job well! Produced by The Amoralists, “Ghosts in the Cottonwoods,” is a gripping new drama written and directed by Obie-Award-winning playwright Adam Rapp and brought to life so magnificently by Sarah Lemp, Nick Lawson, William Apps, Mandy Nicole Moore, James Kautz, and Matthew Pilieci. Making this play even more realistic are the set designs by Alfred Schatz, the lighting design by Keith Parham, and the sound design by Eric Shimelonis. Suspenseful, thrilling, and engulfing are just some of the ways I would describe Adam Rapp’s “Ghosts in the Cottonwoods.” Set in present time, the play takes place in that uncharted forested region between the interstate and the factory outlet in the southern midwest. On the night of a terrible storm, a single mother (“Bean Scully” played by Sarah Lemp) and her younger son (“Pointer Scully” played Nick Lawson) await the arrival of the older son (“Jeff Scully” played by James Kautz), who has broken out of prison. Two others arrive before him: A stranger with a wounded leg (“Newton Yardly” played William Apps) and a girl with a suitcase (“Shirley Judyhouse” played by Mandy Nicole Moore). What happens next, is the ride you are taken on. The chemistry of this cast is terrific and they should all be applauded, especially when they switch between compelling drama to moments of laugh out loud comedy. 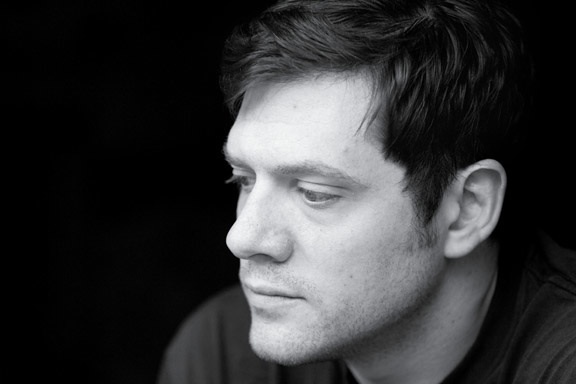 Adam has written a play that is smart, suspenseful, and thriller-like. He takes you on a journey and as you are getting sucked in, there is a moment that hits as if Adam has reached out with his hands and grabbed you tight with the intensely high drama that ensues for the remainder of this 90 minute intermissionless play. 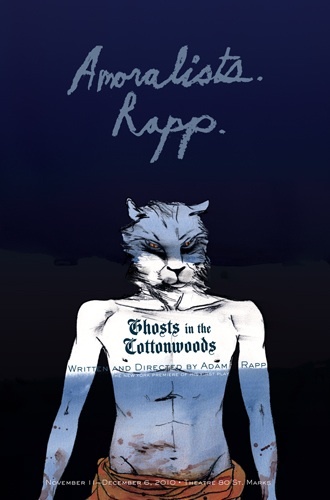 If you are looking for a play that will not only engross you, but will show you the brilliance that is Adam Rapp, then I highly suggest checking out “Ghosts in the Cottonwoods” before December 6 at Theatre 80 Saint Marks in NYC (80 St. Marks Street, between 1st and 2nd Ave, NYC). For tickets, click here! This show does contain nakedness.